STOCKHOLM — Sweden was the first European country to introduce bank notes in 1661. Now it’s come farther than most on the path toward getting rid of them. “I can’t see why we should be printing bank notes at all anymore,” says Bjoern Ulvaeus, former member of 1970’s pop group ABBA, and a vocal proponent for a world without cash. In most Swedish cities, public buses don’t accept cash; tickets are prepaid or purchased with a cell phone text message. A small but growing number of businesses only take cards, and some bank offices — which make money on electronic transactions — have stopped handling cash altogether. Three percent is still too much if you ask Ulvaeus. A cashless society may seem like an odd cause for someone who made a fortune on “Money, Money, Money” and other ABBA hits, but for Ulvaeus it’s a matter of security. “If there were no cash, what would they do?” says Ulvaeus, 66. The Swedish Bankers’ Association says the shrinkage of the cash economy is already making an impact in crime statistics. “Less cash in circulation makes things safer, both for the staff that handle cash, but also of course for the public,” says Par Karlsson, a security expert at the organization. “If people use more cards, they are less involved in shadow economy activities,” says Schneider, an expert on underground economies. Get the prescription for reclaiming America’s heritage of liberty, justice and morality – Joseph Farah’s “Taking America Back,” autographed only at the WND Superstore. “The best defenses against violent extremist ideologies are well-informed and equipped families, local communities, and local institutions. Their awareness of the threat and willingness to work with one another and government is part of our long history of community-based initiatives and partnerships dealing with a range of public safety challenges,” the report says. The following was handed out to surplus stores by agents of the FBI in Denver in recent days. The DHS report had followed only by weeks a report from the Missouri Information Analysis Center that linked conservative groups to domestic terrorism. The Missouri report warned law enforcement agencies to watch for suspicious individuals who may have bumper stickers for presidential candidates such as Ron Paul, Bob Barr and Chuck Baldwin. It further warned law enforcement to watch out for individuals with “radical” ideologies based on Christian views, such as opposing illegal immigration, abortion and federal taxes. Officials with Oath Keepers.org noted the document was similar to one earlier given to gun store managers in Utah. Authorities in Denver confirmed to WND that related brochures are going to surplus stores, hotels and motels, farm supply companies that handle fertilizer and gun shops. 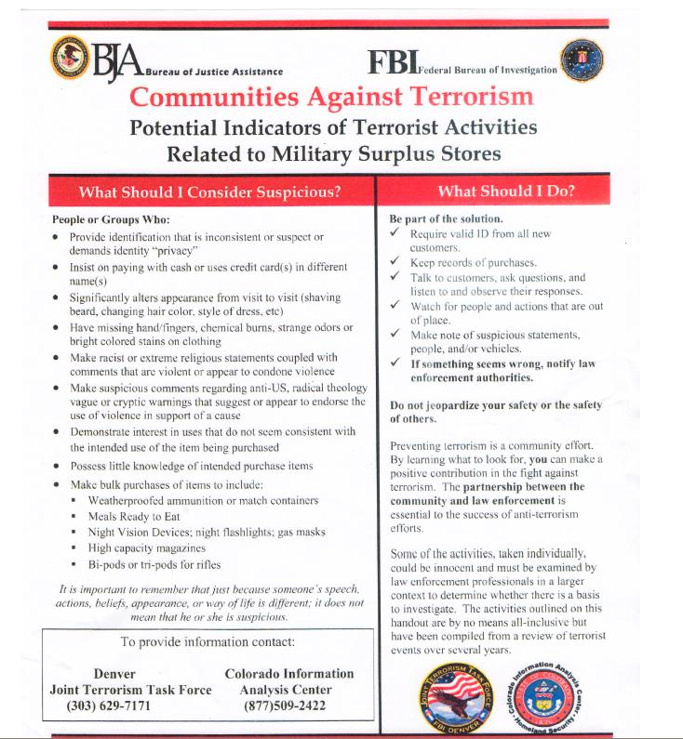 “This new handout expands the absurdity by now also targeting customers of military surplus stores, and by specifically targeting the purchasing of very common, and very popular, preparedness items such as Meals Ready to Eat (MREs) as ‘potential indicators of terrorist activities,'” said a statement from Oath Keepers founder Stewart Rhodes. An FBI spokesman in Denver confirmed to WND that the flyer is genuine. “It has been disseminated throughout the United States by the FBI. The flyer and the information on it, stands on its own merit. It was created by FBI headquarters in Washington, D.C., the Denver Division has placed our contact information on the flyer and distributed it to local businesses within the states of Colorado and Wyoming. In addition to contact information for the FBI, the flyer also had a telephone number for the Colorado Information Analysis Center, a law enforcement “fusion” center where director Dana Reynolds told WND it’s just part of the information-collecting done by the government. He said when tips are turned in about suspicious activity, they are evaluated to determine whether there should be a police investigation. One-time Colorado congressional candidate Rob McNealy, who also is a decision-maker in the Libertarian Party, told WND he came across the flyer to surplus stores among his circle of friends and quickly confirmed it was genuine. Then the FBI asks store managers to report the “suspicious” activity of buying the same items. “It’s almost like entrapment,” McNealy said. He warned that such practices could be used as attacks on free speech, the right of association and other constitutional provisions. And he believes authorities are targeting Americans who choose to prepare themselves for emergencies. “Al-Qaida terrorists are not running around buying MREs,” he said. “They lump them all together,” he said. Oath Keepers reported last year that it appeared the Southern Poverty Law Center had become “officially” part of DHS. That was because the chief of the SPLC “now sits on the DHS ‘Working Group on Countering Violent Extremism’ along with the leaders of other so-called non government organizations,” the group reported. “It should come as no surprise to see Joint Terrorism Task Forces in states now listing the purchasing of firearms, high capacity magazines, bi-pods, night vision, MREs, weatherproofed ammunition containers, etc. as ‘potential indicators of terrorist activities’ since SPLC is almost entirely focused on going after the militia movement and the Patriot Movement, and is also focused on relentlessly demonizing and smearing nearly any individual or group on the political right that advocates strict adherence to the Constitution or who advocates for the right to bear arms, for state nullification of unconstitutional federal laws, etc. which is why SPLC also has a special animus toward Oath Keepers, which it has labeled as one of the most worrisome groups out there, because it contains active duty police and military who advocate for strict obedience to the Constitution and who pledge to refuse to obey unconstitutional orders,” Rhodes wrote at the time. “They see all of us on the patriot right as being terrorists or potential terrorists, and they intend to use all the power of government to control, suppress, marginalize, investigate, track, and if possible, prosecute us all until they stamp out our beliefs and views,” Rhodes told WND. “How far we have come from the Founder’s ideal of a ‘well regulated’ (well equipped and well trained) citizen militia where ALL able bodied citizens were expected to keep and bear their own weapons, ammunition, field gear, and other supplies essential to personal military capability and competence. And the Founders expected us to keep that military gear at home and to actually train together in its use so we would ‘be prepared’ for anything, you know, like the Boy Scouts motto. That motto is a sad remnant of the Founders’ ideal of a prepared citizenry,” Rhodes wrote. “Under the logic of this most recent handout, the Boy Scouts should be reported as ‘suspicious,'” he wrote. “The Founders would have wanted all of us, every one, to ‘be prepared’ for ‘any old thing.’ They would have wanted us to have night vision, gas masks (which come in handy in many situations), ‘high-capacity’ magazines – and the powerful military pattern rifles that use them – bi-pods so we can shoot accurately at long distance, and plenty of ammunition in ‘weatherproofed’ containers (also known as surplus ammo cans). They would have wanted us to have plenty of MREs for handy field use, and even ‘night flashlights.’ I suppose ‘day flashlights’ are OK with the FBI Joint Terrorism Task Force, but those dangerous ‘night flashlights’ are verboten, and anyone who buys one must be reported! I certainly hope it wasn’t actually someone at the FBI who wrote that. “Funny thing is, who exactly do the authors of these handouts think they are talking to when they ask gun store and military surplus store owners and staff to spy on their customers and serve as a network of government snitches? These stores are usually owned and staffed by veterans, who are also very preparedness minded – in other words, just like the customers the government wants them to inform on. That’s like handing the MIAC report to Ron Paul and Chuck Baldwin supporters and asking them to keep an eye on those pesky, subversive, and potentially dangerous Ron Paul and Chuck Baldwin supporters. It’s absurd,” Rhodes wrote. The U.S. administration has made clear in a number of cases that it is concerned about conservatives as a potential danger and even has argued in court that it wants the authority to track American citizens in order to develop “probable cause” needed for search warrants. That argument is being made before the U.S. Supreme Court in a dispute over whether police investigators and other authorities should be allowed to track American citizens who have not done anything that would ordinarily prompt a judge to issue a search warrant. “The court of appeals’ decision, which will require law enforcement officers to obtain a warrant before placing a GPS device on a vehicle if the device will be used for a ‘prolonged’ time period, has created uncertainty surrounding the use of an important law enforcement tool,” said the government’s brief in the case, U.S.A. v. Antoine Jones. Long lines at store checkouts could be history if a new technology created in part at Rice University comes to pass. Rice researchers, in collaboration with a team led by Gyou-jin Cho at Sunchon National University in Korea, have come up with an inexpensive, printable transmitter that can be invisibly embedded in packaging. It would allow a customer to walk a cart full of groceries or other goods past a scanner on the way to the car; the scanner would read all items in the cart at once, total them up and charge the customer’s account while adjusting the store’s inventory. 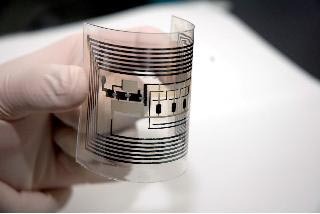 RFID tags printed through a new roll-to-roll process could replace bar codes and make checking out of a store a snap. RFID tags are almost everywhere already. The tiny electronic transmitters are used to identify and track products and farm animals. They’re in passports, library books and devices that let drivers pass through tollbooths without digging for change. The technology behind RFID goes back to the 1940s, when Léon Theremin, inventor of the self-named electronic music instrument heard in so many ’50s science fiction and horror movies, came up with a spy tool for the Soviet Union that drew power from and retransmitted radio waves. Cho, Tour and their teams reported in the journal a three-step process to print one-bit tags, including the antenna, electrodes and dielectric layers, on plastic foil. Cho’s lab is working on 16-bit tags that would hold a more practical amount of information and be printable on paper as well. Cho came across Tour’s inks while spending a sabbatical at Rice in 2005. “Professor Tour first recommended we use single-walled carbon nanotubes for printing thin-film transistors,” Cho said. Tour’s lab continues to support the project in an advisory role and occasionally hosts Cho’s students. Tour said Rice owns half of the patent, still pending, upon which all of the technology is based. “Gyou-jin has carried the brunt of this, and it’s his sole project,” Tour said. “We are advisers and we still send him the raw materials” — the single-walled carbon nanotubes produced at Rice. Printable RFIDs are practical because they’re passive. The tags power up when hit by radio waves at the right frequency and return the information they contain. “If there’s no power source, there’s no lifetime limit. When they receive the RF signal, they emit,” Tour said. Tour allayed concerns about the fate of nanotubes in packaging. “The amount of nanotubes in an RFID tag is probably less than a picogram. That means you can produce one trillion of them from a gram of nanotubes – a miniscule amount. Our HiPco reactor produces a gram of nanotubes an hour, and that would be enough to handle every item in every Walmart. Remember VeriChip, the Florida company that once dreamed of injecting its human-implantable RFID microchips in everyone from immigrant guest workers to prison inmates? We haven’t heard much from the company since a dipping stock price nearly got it delisted from the NASDAQ in March. But it’s still alive, and in November it pulled off a seemingly incongruous acquisition. Now called PositiveID, the new company is a merger between VeriChip and Steel Vault, the people behind NationalCreditReport.com. VeriChip and its former owner Applied Digital have been drawing fire since 2004, when the FDA approved the rice-sized injectable RFID for human use. 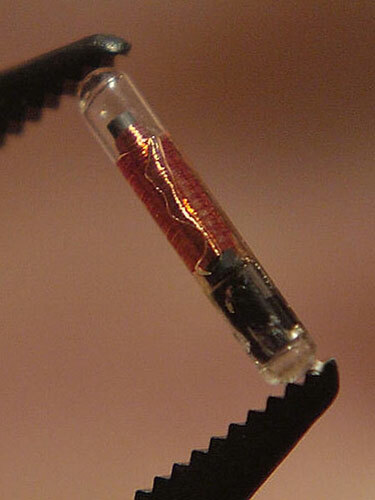 While the company primarily pushed the chip as part of a system to index medical records — a kind of subcutaneous MedAlert bracelet — Richard Sullivan, then-CEO of Applied Digital, had a penchant for wantonly confirming every nightmare of cybernetic social control. After 9/11, it was Sullivan who announced the VeriChip would be perfect as a universal ID to distinguish safe people from the dangerous ones. He dreamed of GPS-equipped chips being injected into foreigners entering the United States, prisoners, children, the elderly. He thought the VeriChip would be used as a built-in credit or ATM card. Indeed, in 2004, one of VeriChip’s earliest deployments was at a Barcelona nightclub, where VIP patrons could pay 125 euro to get the chip installed in their arms as a debit card for drinks. But today, Sullivan’s replacement says the company has no plans to market the VeriChip as a path to instant credit, despite the recent acquisition. With his white-buttondown shirt open at the chest, PositiveID CEO Scott Silverman spoke about the merger in an interview at the company’s office suite in Delray Beach, Florida. “Using the chip to relate to the credit-reporting services of NationalCreditReport.com, or even using it for financial transactions … has not been a part of our business model for five years or more, since Sullivan’s been gone, and is not part of our business model moving forward,” he says. Silverman also backed away from some of the Orwellian ideas floated by his cyberpunk predecessor. “I can tell you that … putting [the chips] into children and immigrants for identification purposes, or putting them into people, especially unwillingly, for financial transactions, has [not] been and never will be the intent of this company as long I’m the chairman and CEO,” he says. Yet in 2004, Silverman told the Broward-Palm Beach New Times that the VeriChip could be used as a credit card in coming years. And in 2006, he went on Fox & Friends to promote the chipping of immigrant guest workers to track them and monitor their tax records. And ahead of the recent merger, VeriChip gave a presentation to investors hinting there would be some cross-pollination between the two sides of the business. It plans to “cross-sell its NationalCreditReport.com customer base” (.pdf) the Health Link service and vice-versa. So, Americans with implanted VeriChips will be encouraged to divulge their finances to PositiveID, while credit-monitoring customers will be marketed the health-record microchip. Critics of chipping are moved by a variety of concerns, ranging from the pragmatic to the religious — anti-RFID crusader Katherine Albrecht believes the technology is the Mark of the Beast predicted in the Book of Revelation, but also doubts its efficacy as a medical tag: VeriChip’s instruction manual warns that the chip may not function in ambulances and areas where there are MRI and X-ray scanners. Security is another issue. RFIDs can generally be scanned from distances much greater than the official specs suggest. Nicole Ozer at the ACLU of Northern California notes that after Wired magazine writer Annalee Newitz experimentally cloned her VeriChip in 2006, the company continued calling it secure. Whatever its plans for the future, PositiveID is focused on its original mission for now: implants tied to medical records. On December 1, the new company announced it’s collaborating with Avocare, a Florida health care business, in the hopes of bringing its “health care identification products” to 1 million patients. The Federation of Small Businesses said it will ‘strongly oppose’ any move to get rid of cheques. Cheques are to be abolished under controversial plans being drawn up by bankers. They are widely expected to vote next month for the chequebook to be consigned to history. Yesterday, the move was criticised by consumer groups, business lobbyists and charities representing the elderly. They raised fears that vulnerable people, who have relied on their chequebook all their lives, will be left confused. Many others simply prefer to pay by cheque, instead of by direct debit or bank transfer. The Payments Council said its research shows the number of cheques being written every day has fallen dramatically in recent years. At their peak in 1990, around 11million cheques were written every day. Latest figures show the number has dropped to around 3.8million. Cheques, which were first used in Britain 350 years ago, are also an expensive form of payment for banks. 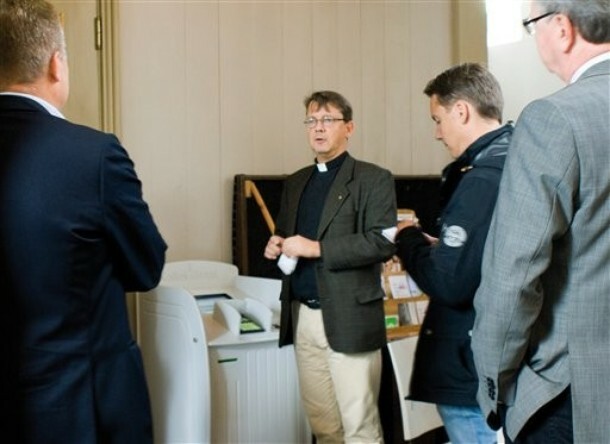 They cost around £1 each to process, which is four times as much as electronic payments. The council’s 15-strong board – made up of 11 banking representatives and four independents – will take a decision on December 16. The most likely date for cheques to be phased out in the UK is 2018. A growing number of stores including John Lewis and Tesco have stopped accepting cheques. Stores claim they are the most insecure form of payment and that abolishing them cuts queues at checkouts. But cheques are still widely used for making payments to local tradesmen and for utility bills. Government departments, such as HM Revenue & Customs and the Department for Work and Pensions, rely on cheques to make millions of payments each year. Andrew Harrop, head of public policy at Age Concern and Help the Aged, said: ‘Many older people use cheques and cash for all their transactions and are uncomfortable with alternative payment methods, such as credit or debit cards with PIN numbers. Sandra Quinn, a director of the Payments Council, said: ‘We are completely aware that elderly, disabled and disadvantaged people need alternatives to be in place. VeriChip (CHIP), the company that markets a microchip implant that links to your online health records, has acquired Steel Vault (SVUL), a credit monitoring and anti-identity theft company. The combined company will operate under a new name: PositiveID. The all-stock transaction will leave PositiveID in charge of a burgeoning empire of identity, health and microchip implant businesses that will only encourage its critics. BNET previously noted that some regard the company as part of a prophecy in the Book of Revelation (because the HealthLink chip carries an RFID number that can be used as both money and proof of ID) or as part of President Obama’s secret Nazi plan to enslave America. Unless, of course, consumers don’t actually want to be implanted with chips, have their health records available over the internet, or have their medical records linked to their credit scores. The day has arrived where all the money in the world is at your finger tips. Or rather, all the money in your credit card is in your finger veins. Biometric scanners are popping up everywhere, and now Hitachi has debuted the first vending machine that will accept a finger scan instead of cash or coins. By linking the scan to a credit card account, customers can simply place their finger in the machine and purchase whichever snack goods they desire most. It’s probably the best reward you’ll ever get for giving a vending machine the finger. The biometric sensor in Hitachi’s new vending machine uses light to scan and read the number and orientation of veins in your finger tip without directly touching a sensor. This provides a unique code for access to a credit card account that has to be established independently of the vending machine. While the machine is only a prototype, and Hitachi hasn’t yet decided whether or not to make a commercial version, the concept itself is more than enough to be causing a buzz. It’s far from the first use of a biometric sensor, but it has the potential to be the most commonly seen application of the technology. Even if the vending machine industry doesn’t jump on Hitachi’s band wagon, the biometric sales option is ready to be explored. With credit card companies like Visa and Mastercard already providing a “tap and pay” system for cards, consumers may become more confident with payments that don’t require signatures or even human-human interaction. This means that finger scans could very well become a break-out technology. If you’re willing to tap a card, why not just point your finger instead? Hollywood movies often portray biometrics as added levels of security for very expensive items or collections. Eye scans to enter bank vaults spring readily to mind. The speed of biometric verification, however, makes it just as sensible to go in the other direction. Need to pay $5? Just let the machine count the veins in your index finger. It’s faster than reaching for your wallet. Which may or may not be a good thing. It’s unclear if the hassle of paying for things has a profound affect on the way we spend money. There may be a lot more impulse purchases when you can pay for things by just tapping your finger. Amazingly, this isn’t the only way that vending machines are getting complex. There are vendors with LCD display and touch screens, and others with conveyor belts or claws instead of those twisting springs. I think that they serve as a good testing ground for emerging commercial technologies. After all, like new high-tech ATMs, they are one of the few public machines that interact with hundreds or thousands of people each day. With biometrics looking to identify you through your ear, or even your brain, the finger vein technology from Hitachi seems like a more acceptable option. It will be interesting to see if the concept of linking credit cards to a biometric scanner becomes widely popular. Perhaps it will be adopted somewhere else. iTunes? Kindles? Pay toilets?